Rough, raw - crude even - are the adjectives I'd use to describe the two part Be Yourself, but the power and commitment of Ross' vocal can't be denied. The socially relevant lyrics belong to the "Say It Loud" era but the music could have been cut at any time from about 1955 onwards so elemental is the rhythm section and solo tenor sax. The astonishingly "muddy" production sounds as though the recording was made in somebody's garage rather than a professional studio - and so rare is this 45 that it might well have been. The 45 hails from Sacramento, CA. 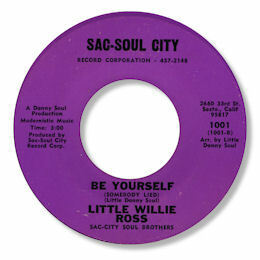 UPDATE ~ Dante Carfagna writes about the Sac-Soul City label - "Sac Soul City was run by Danny “Soul” Young, a local promoter and businessman who established himself as a mover-and-shaker on the Sacramento scene. His label’s releases, of which there are few, were distributed out of his regional record chain called Danny’s Modernistic Soul Shop." I'm very grateful as always to Dante (see Links). Note ~ My great friend Greg Burgess wonders if this artist could be an R&B guitarist called Willie Ross working out of Cleveland, Ohio in the 60's and 70's. Frank McComb (R&B singer) states him as a major influence. He was also a musician member of the Walter Barnes Jr and the Men of Ministry. Can anybody confirm?